The Touch Bar on the new MacBook Pro is being advertised as a brilliant tool that will contribute to the next leap forward in human innovation, but that doesn’t mean users can’t have a little lighter hearted fun with the new Touch Bar too! Here are some of the absolute silliest uses of Touch Bar on the new MacBook Pro that we’ve seen thus far… and while they’re admittedly goofy, you can’t deny they do show off some creative thinking about how to use that fancy new Touch Bar. Lemmings was (is?) a ridiculously fun and addictive puzzle video game from 1991 where you’d direct a bunch of lemmings through various obstacles. Good news: if you have a new MacBook Pro, you can have Lemmings on your Touch Bar. You can get Touch Bar Lemmings here. More retro gaming goodness: Pac-Man on your Touch Bar! Imagine how productive you will be with Pac-Man running around on your Mac Touch Bar, you will surely get all sorts of work done. Get Pac-Bar here if you’re into the idea. Remember DOOM, the first person shooter game? If not, you probably had better things to do in the 90s. But for us geeks, DOOM was a revolutionary PC game that debuted in 1993. 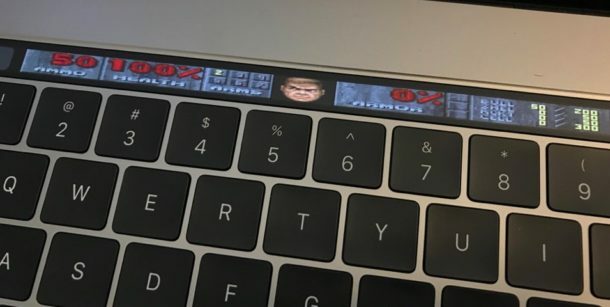 Now DOOM is back, but for the Touch Bar! Wow, amazing! Not sure how playable that really is, but it is innovative thinking, right? No source is available for this one yet, unfortunately. Conveyor belt sushi, the sushi train, the sushi-go-round, whatever you want to call it, you can now have a conveyor belt serving up Sushi emoji on your Touch Bar. By the way, if you see the Sushi emoji conveyor belt on the Touch Bar and then decide you’re hungry, try searching for the emoji in iOS search to find a nearby restaurant, yes really! And yes it’s real, you can get it on GitHub if you want to. Is it possible for any Apple product or feature to be released without someone tying it immediately to a virtual whoopee cushion? Probably not, and “Touch Fart” proves that point. You’ll have three different, uh, noise options, on your MacBook Pro Touch Bar. Just what you wanted, a $3200 digital whoopee cushion! Yes of course you can get this one on Github too. Remember the TV show Knight Rider with David Hasselhoff? Maybe you do, maybe you don’t. Regardless, Knight Rider had a high tech car with a little chasing red light, and now you can get that same little chasing red light as an animation on your Touch Bar. Innovation at it’s finest. You can get KnightTouchBar2000 on Github if you’re interested. How about turning your MacBook Pro Touch Bar into a piano? Tap out some music while you’re coding or working in Microsoft Office! Who needs Garageband when you have a Touch Bar Piano? You can get Touch Bar piano here. And if you’re feeling envious about not yet having a MacBook Pro with Touch Bar, you can always try out the Touch Bar yourself in a virtual setting with Touche or TouchBarDemo. How’s that for innovation? Perhaps these are not the best uses of the Touch Bar (or maybe they are! ), but they sure are entertaining in their own silly way. I’m sure many more great innovations will arrive on the Touch Bar MacBook Pro the longer it’s out in the wild for developers to build for, let us know in the comments if you find any other good ones. You forgot one ……. The virtual escape key! Now THAT is silly! They removed the escape key and made it an indented weird virtual button with no feedback! Apple is slowly moving towards turning their PC line into crippleware devices like ipods/ipads/iphone/ios devices. That’s why they are promoting iPads as PC replacements. Priming non-technical computer users into beleiving they are computer savants. I’d buy the new touch bar if it was her programable and in addition to the existing function keys…not in replacement of them. No backspace….no escape key. Next they will remove the enter button and force users to use Siri to ask permission to accept keyboard inputs. I haven’t seen a good use of touch bar yet. It sounds like a gimmick at the expense of function. Not very apple like! Not a gimmick, there are many useful things you can do with it. I actually find it quite useful. It allows me to accept autocomplete suggestions from the comfort of my keyboard and also allows me to quickly enter the screensaver when I want to leave my computer for a short while. I also quite prefer the sliders for volume and brightness, and I know, you could push cmd + shift + volUp/Down to get finer tuning, but this is a lot cleaner and nicer. I can also remove the useless mission control and expose buttons, and replace them with things far more useful. A piano keyboard could be used by music notation applications like Finale, Sibelius, MuseScore, etc. ‘Silly’ seems to be a poor description for this group of offerings, and if the author truly wants to leave the absolute ‘rubbish’ in the past should have avoided mentioning it? Apple have abandoned ‘Function before Form’ particularly with regard to consideration of users with less than perfect faculties. Progress Bars that do not appear to do anything meaningful or do not exist. Drab faded presentations of options where those unavailable are difficult to discern amongst their ‘grey’ surroundings. Also hardware changes seemingly implemented randomly perhaps suggesting that the Management Team is less well ordered than a few years ago? These so called ‘sillies’ seem to be available from ‘sources’ so how long will it be before they will be used for purposes that will not benefit anyone other than the originator? If this is true it is difficult to believe that Apple have allowed this to happen. After all control over the entire system elevated Apple to the position it enjoys today. Are they really ‘losing it’? Come on Apple. This is beyond a stupid idea. What were they thinking? I’m clearly feeling the loss of Steve Jobs…. I think Tim Cook is not the person to lead it. Didn’t he say a couple of years ago the pipeline had some great products in it? Where are they? Aren’t the computers getting a bit long in the tooth? I love my iMac and iPhone but I don’t think they stand out above others’ any longer. @Ogles The reason you haven’t seen a good use of the touch bar is because (1) no one has yet written a decent article describing best uses because (2) authors, like Horowitz, are wasting our time self-promoting inane content; and (3) the technology is in its early evolutionary phase requiring actual author research “effort” to report. I did read a fairly well written article recently about the new MBPro with its new touch bar that illustrated various applications where the touchbar was useful. I’d link the article if I could recall the source but it left me feeling more encourage about moving to the new laptop sooner than later. Is there a good use for Touch Bar? Not yet, from what I have seen. Touch Bar hasn’t been out long enough for developers to come up with really great uses for it. Maybe it will happen. Apple seems to have the strategy of throw something out there and see if developers can make it useful, which drove a lot of interest in iPhone initially but now most people only use a small handful of apps while the app store is littered with junk nobody will ever see or want. From my experience and from other power users, at the moment Touch Bar is just not that useful because most of us don’t ever look at the keyboard to type or interact, and Touch Bar requires pulling attention away from the screen to fiddle with the keyboard, kind of like when you were learning to type at age 8. I’ve read a lot worse about it too from power users, who call it outright useless or a gimmick, but I think time will have to tell if that is the case. I am skeptical based on that, it appears to be an added layer of complexity, not a simplification. Personally I hope next year Apple releases a real Pro MacBook Pro and offers the real keyboard across the product line on top of the line models. I don’t want a gimmick screen of Emoji on the keyboard, I want a keyboard.